1) Batter hit by pitch while squared to bunt but pulls his bat back. 2) Umpire hit by fair batted ball. Robert asked: With a runner at second base a batter squares to bunt. The runner takes off for third. 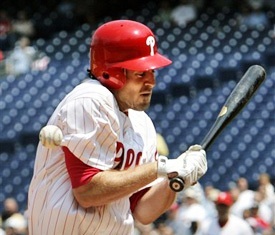 The batter pulls his bat back but is unable to get out of the way and is hit by the pitch. The runner successfully reaches third. Rick answered: Robert, thank you for your questions. 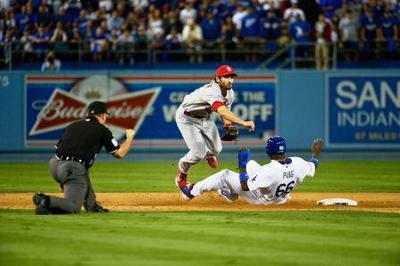 Rule 5.09 a...Runner not forced, goes back to second on the dead ball, batter awarded first base. Robert also asked: Runners are at first and third. A fair batted ball hits the umpire standing in the "C" position. Runner at third scores and runner from first advanced to second and the batter reached first without being thrown out. Rick answered: I am not familiar with what the "c" position is for the umpire; but am guessing it is the position indicated in the second photo above, in the middle of the infield. If that is the case, a fair ball that touches an umpire before it touches a fielder or passes any fielder except the pitcher: Dead ball, runners return to bases occupied at the time of the pitch unless forced by batter-runner. Batter awarded first base and credited with a single. So, dead ball, the runner from third is returned to third, runner from first stays at second as he was forced by the batter-runner, batter-runner is awarded first base and credited with a single.